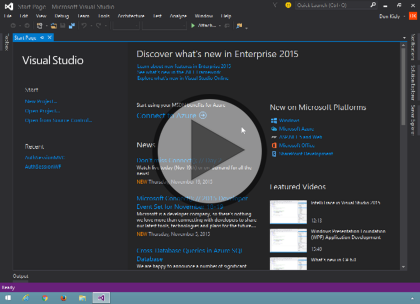 Nothing is stopping you from using your favorite text editor and command line tools to build .NET projects, but Visual Studio provides an environment that will help you be much more productive. In this course you'll learn about some of the best features of Visual Studio and learn how to create complete solutions with it. You'll also learn about the rich support for debugging in both C# and Visual Studio, so you can hunt down the causes for problems in your applications. This is an entry level course. Some amount of programming experience will be helpful and speed up your learning but you can jump right into this course at any level. Don Kiely is a featured instructor on many of our SQL Server and Visual Studio courses. He is a nationally recognized author, instructor, and consultant specializing in Microsoft technologies. Don has many years of teaching experience, is the author or co-author of several programming books, and has spoken at many industry conferences and user groups. In addition, Don is a consultant for a variety of companies that develop distributed applications for public and private organizations.